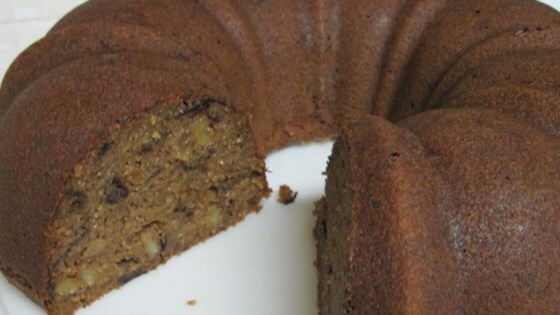 "This moist cake was a favorite of mine as a child - probably because it meant I could have cake for breakfast! Moist, spicy and delicious any time of day!" Preheat the oven to 350 degrees F (175 degrees C). Grease and flour a 9 inch tube pan. In a large bowl, mix the shortening and sugar with an electric mixer until smooth. Mix in the eggs one at a time, then stir in the vanilla and prunes. Sift the flour, allspice, nutmeg, cinnamon, salt, baking powder and baking soda into a large bowl or onto a sheet of waxed paper. Stir in the dry ingredients 1/3 at a time, alternating with the buttermilk. Mix in the walnuts if using. Pour batter into the prepared pan. Bake for 50 minutes in the preheated oven, or until a toothpick inserted in the crown of the cake comes out clean. Cool on a wire rack for at least 10 minutes before inverting onto a serving plate. Fortunately the kids who truly do not like prunes LOVE it. Thanks for this great recipe. With the shells of the walnuts I made my 'hair-paint' at the same time. Lovely!